Anika van de Wijngaard has written an article (in Dutch) in the Leidsch Dagblad about Elleke’s ‘Indische Letterenlezing’ on 22 September. Aminatta Forna, OBE (novelist and memoirist, Lannan Visiting Professor of Poetics at Georgetown University) will be in conversation with Elleke Boehmer in the first event of the Mellon-Sawyer Seminar Series 2017-18 ‘Post-War: Commemoration, Reconstruction, Reconciliation’. 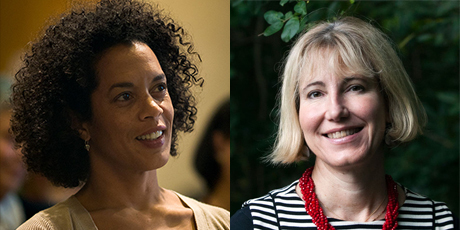 In this conversation, award-winning novelist and memoirist Aminatta Forna and Elleke Boehmer will discuss the ways in which Forna’s work (which includes her novel The Memory of Love and memoir about Sierra Leone, The Devil That Danced on the Water) have portrayed situations of conflict and post-conflict, and how literature can offer new perspectives on commemoration, reconstruction and reconciliation. Elleke Boehmer and acclaimed author Ali Smith will be the keynote speakers at the ‘Katherine Mansfield: New Directions’ international conference, which will take place on 28-29 June 2018 at Birkbeck, University of London. On Friday 22 September 2017, Elleke Boehmer will give the very first ‘Indische Letterenlezing’ in Leiden. She will be speaking on the future of the postcolonial past.